Mitchel-Lincoln Packaging president Jimmy Garfinkle strikes a pose at the feed end of the 8.20 EXPERTLINE flexo folder-gluer installed last year at the company’s St-Laurent facility. There’s no business like family business for hands-on learning of the industry in which you make your living. For Mitchel-Lincoln Packaging Ltd. president Jimmy Garfinkle, whose family has owned and operated the St-Laurent, Que.-headquartered company for more than five decades, that learning process never gets boring or stale. “Since my father, Mitch Garfinkle, started up Mitchel-Lincoln in 1965, he always remained very hands-on and open,” says Garfinkle. “Everyone, from customers to the employees and the community, were always comfortable in approaching him with questions or ideas. “You had a better chance of finding him on the factory floor—talking with customers, operators or the truck drivers—than finding him in the office,” says Garfinkle, describing the close-knit nature of the Canadian corrugated packaging business. As Garfinkle explains, his father’s philosophy of growing and sustaining a successful business by focusing on the importance of continuous improvement—while maximizing process efficiency and productivity—has provided a solid foundation upon which the company, its markets, and its customer base all continue to grow to this day. This mindset has enabled Mitchel-Lincoln to come a long way from its modest beginnings in 1965 through a combination of astute business partnerships, acquisitions and volume-driven expansion. A state-of-the-art, 280,000-square-foot plant in Drummondville, Que., which houses a 97-inch BHS corrugator and numerous high-speed converting machines. 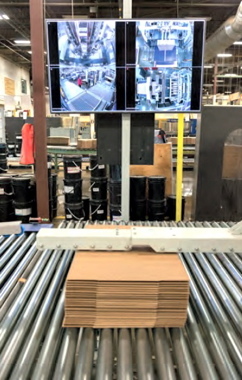 A Toronto-based New Forest Paper Mill recycled containerboard plant—operating as a joint-venture company with Atlantic Packaging of Toronto—manufacturing linerboard and medium used in the construction of corrugated boxes. 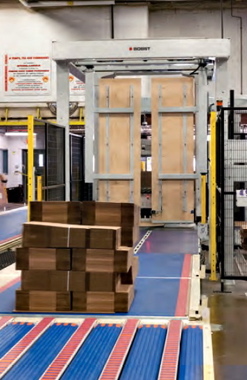 A specialty corrugated products plant packaging plant in Vaudreuil, Que.—manufacturer of triple-wall containerboard and a broad range of flute grades for specialized corrugated packaging products—acquired in a 2014 purchase of Induscorr. Manufactured by Bobst, the recently-installed 8.20 EXPERTLINE flexo folder-gluer has enabled the Mitchel-Lincoln boxmaking facility to achieve record output speeds. With its customer base covering a wide range of markets and products—from general food-and-beverage to high-end cosmetics and other fast-moving packaged consumer goods—Mitchel-Lincoln has worked hard to establish itself as one of the leading players in eastern Canada’s corrugated market. “Our market reach is wider than that of many of our competitors,” says Garfinkle. “We have a trading radius of about 500 miles. “In order to compete at this range, we are continually evaluating our equipment and our processes,” he notes. 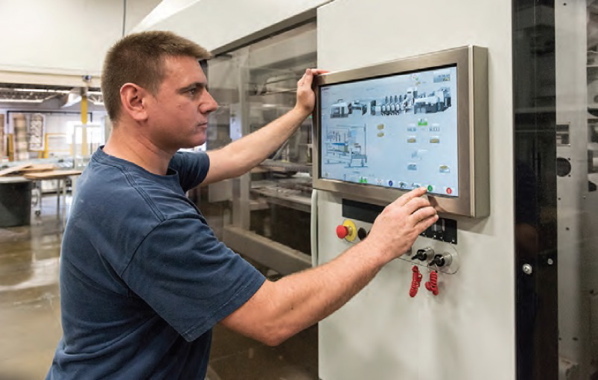 “We are always looking for ways to improve our efficiency and maximize our productivity,” says Garfinkle, pointing to the company’s recent installation of a new state-of-the-art flexo folder-gluer at the company’s St-Laurent facility. The intuitive operator controls of the 8.20 EXPERTLINE flexo folder-gluer machine enable direct manipulation of the machine’s parts using picture-based and numerical scales for optimal user-friendly operation, regardless of the language used. Brought in near the end of 2015 to replace the plant’s existing 30-year-old Martin 924 folder-gluer, still capable of producing top quality products but lacking the many new efficiency enhancing technology available on today’s machines, the new BOBST 8.20 EXPERTLINE flexo folder-gluer made a profound immediate impact at the 220,000-square-foot boxmaking plant with record-setting production levels. In March of this year, the plant’s 8.20 team was cited for setting a new Bobst World Production Record by folding and gluing a total of 162,136 boxes in an eight-hour shift. As Garfinkle explains, Mitchel-Lincoln is not a shop that is married to one specific machine manufacturer. Whenever that company identifies the need to add or replace equipment, it thoroughly surveys the equipment market in search of a solution that both matches its requirements and provides the best value for the plant and its customers. As such, the supplier evaluation process at Mitchel-Lincoln goes deeper than just comparing the equipment capabilities and features alone. “Support is very important to us, and so is knowing that the manufacturer that we select has the infrastructure to provide training for our employees, and quickly resolve any technical or mechanical issues should they arise,” says Garfinkle. “We have always had a good relationship with Bobst, and the BOBST 8.20 EXPERTLINE provided the capabilities we were looking for, including the quick-changeover and ‘set while run’ capabilities. In the nine months since its installation, Garfinkle says the 8.20 EXPERTLINE flexo folder-gluer (FFG) has not only met the plant’s requirements, but also dramatically exceeded earlier expectations. 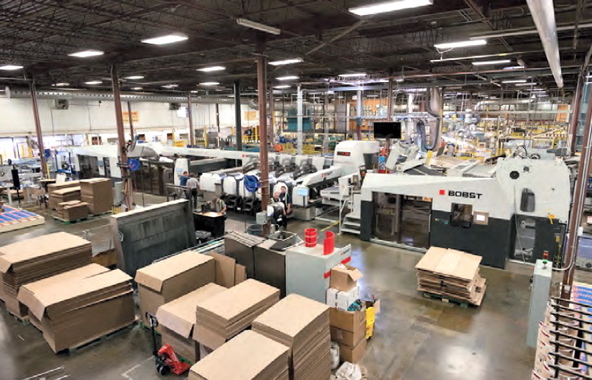 Strategically positioned right at the center of the action of Mitchel-Lincoln’s busy 220,00-square-foot production facility, the 8.20 EXPERTLINE flexo folder-gluer manufactured by Bobst has enabled the plant to achieve dramatic productivity improvements. “Not only did we replace an aging machine with the new capabilities, but we more than doubled our productivity on that line,” Garfinkle relates. “And the efficiency turn has been great. For shorter runs with more frequent changeovers, Garfinkle says the line will often add a third operator to take advantage of the ‘set while run’ and quick-changeover capabilities of the machine. “The downtime for changeovers on this machine is typically short to begin with,” he says, “but when we have a third operator plating up, often while the current job is running, it further reduces the downtime between orders and increases the efficiency of the operation. “This helps us control the cost not only of our operation,” he points out, “but for our customers as well. 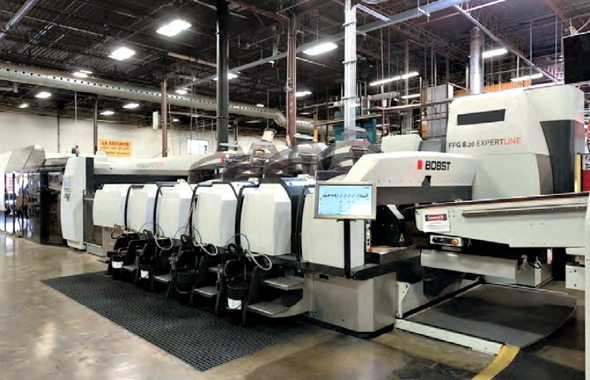 According to Garfinkle, the upgraded line has operated consistently with very little maintenance since the 8.20 EXPERTLINE flexo folder-gluer installation. “Our customers rely on us for timely turnaround and quality that meets or exceeds their specifications,” he points out, “so it is very important to us that we can rely on the machine to meet our requirements and schedule. 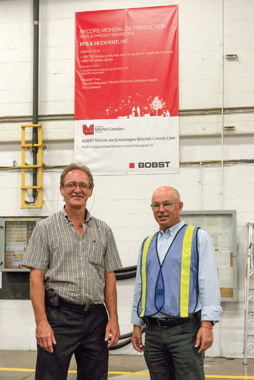 Mitchel-Lincoln Packaging vice-president of operations Pierre Aubry (left) and Jimmy Garfinkle stand underneath a large banner from Bobst acknowledging the world-record 162,136 boxes processed on the 8.20 EXPERTLINE over an eight-hour shift. According to Garfinkle, a successful installation ultimately depends on the confidence of the people operating it, which is why Mitchel-Lincoln considers it important to obtain a “buy-in” for the crews or potential crew members early on. “We were in communication with our employees from the beginning of the evaluation process,” says Garfinkle. Garfinkle says that earning a spot on the 8.20 crew is a coveted position at Mitchel-Lincoln. As for the machine’s performance to date, Garfinkle has nothing but the highest praise. “We’ve been so happy with the overall success of the 8.20 FFG that we’re looking for other opportunities in our manufacturing organization that may be able to take advantage of this technology,” he states. 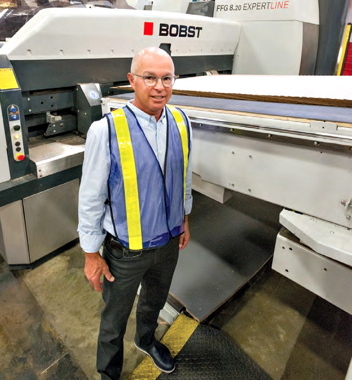 “To that end, we’re currently investigating the feasibility of installing another BOBST 8.20 EXPERTLINE to replace two older folder-gluers in our organization,” says Garfinkle, stressing the importance of staying ahead of the curve in a highly competitive market.